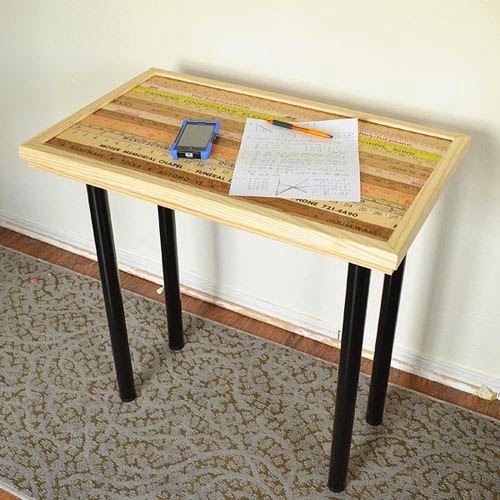 Looking for a unique solution for a little boy needing a homework desk to fit in a little space it was decided that DIY was the best solution. 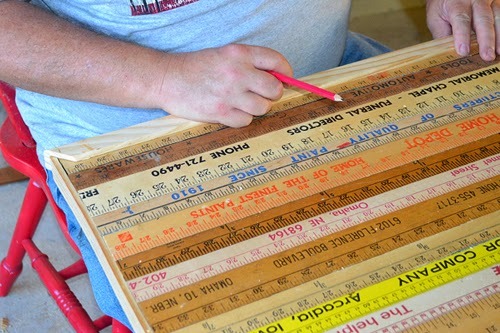 To make it all the more unique and interesting, we used vintage yardsticks as the desktop! 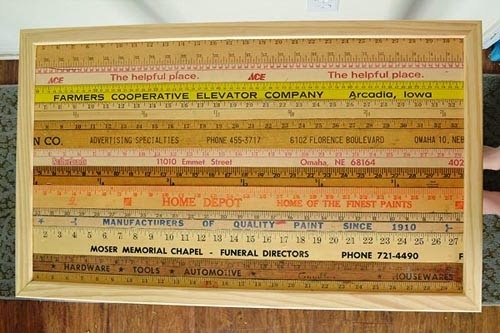 First off you'll need to collect up a bunch of vintage yardsticks. Now I bought lots of them off of Ebay simply because I needed them more quickly than I could find and purchase them from yard sales and thrift stores. As a result of that, some of my sticks aren't quite as vintage as the listing made them out to be. Also, all of my yardsticks are totally different sizes. Had I the time to do this over again, to save a couple of steps and some additional supplies I'd look around town and try to find sticks that are the same thickness. 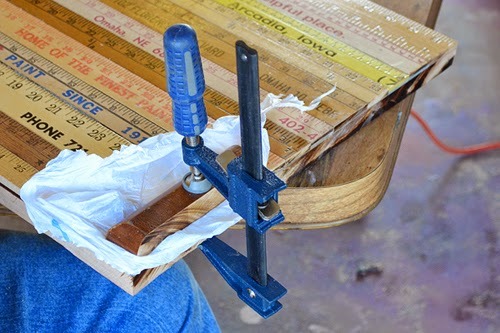 Last of all on purchasing your sticks, you can also go the route of purchasing new sticks and aging them with sanding and different wood stains. I found different sticks from 4 different hardware stores that were all exactly the same thickness and that was without even trying to locate them. 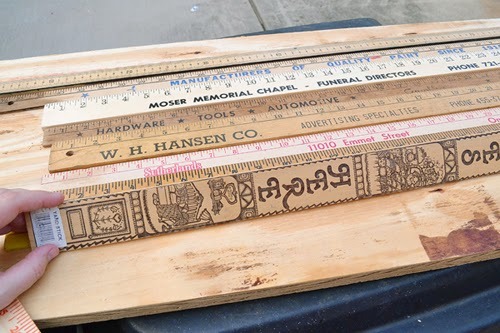 So if you want to save some time and a good deal on your budget, you might consider aging your own "vintage" yardsticks. First you'll need to get a piece of plywood that will act as a sacrificial board. Yep, that's what my dad really calls them. This board you're going to make small cuts into but not cut entirely through. Bust out your Liquid Fusion and sort out your yardsticks as you want them to appear on your table. Now flip them over so that you have the reverse of that. 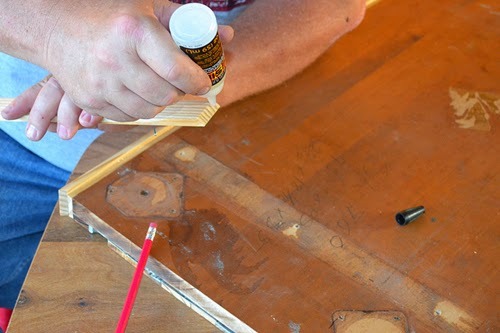 Take your Liquid Fusion and run thin line of glue down the side of one yard stick butting up against the next until all of your sticks have been glued together. Allow to dry. 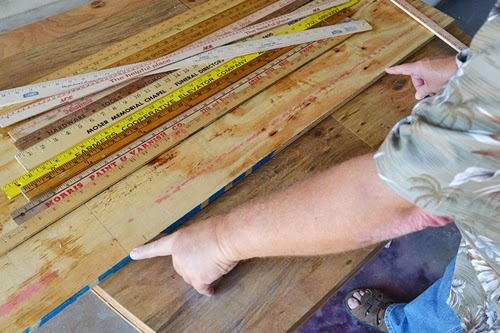 Secure your yardsticks to the sacrificial board using thin wire brads on each end of every yardstick. 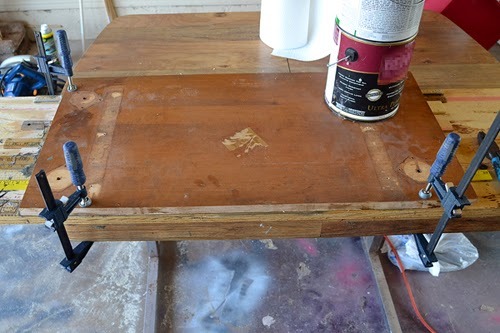 Make sure to attach BEYOND where your cut will be when finishing the table top. Oh, and FYI - there are a whole bunch of thicknesses but two tend to be far more common. Of these two sizes on the thinner you can stack two together to equal the exact height of the taller common size, so keep an eye out for those for an even easier time leveling this sucker out! Since we couldn't get enough thicknesses of wood to properly level out our surface we went with Bondo. This stuff is sold in big box stores, hardware stores and car supply stores and is often used to repair auto body work. Use according to package directions and smooth over the surface to level out. Allow to dry fully (we gave ours overnight). Oh, and fun fact - this stuff is exothermic meaning it gets crazy hot as it sets. Pretty cool! 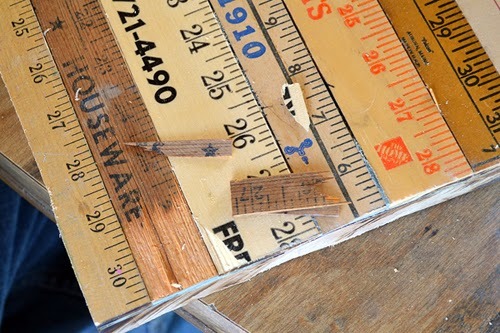 You'll need a piece of plywood or an old table or desk top to adhere your yardsticks to. Here we're using vintage maple table purchased from a garage sale for $5. Since there would be no plywood found any cheaper, this was a great deal. PLUS since this is being built for a boy child, and aged maple is crazy hard, it seemed like an excellent choice! 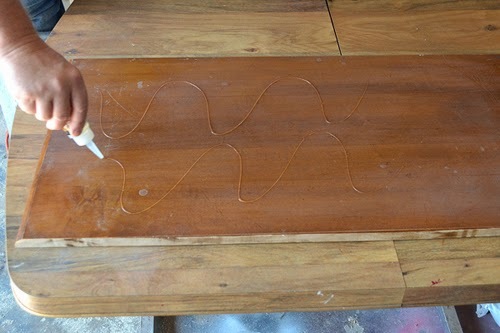 Apply your Liquid Fusion liberally to the smooth side of your wood or table top. Now in this pic, it's hardly liberally... this is just the beginning. You really, really want to get that stuff on paying special attention to the edges and corners. 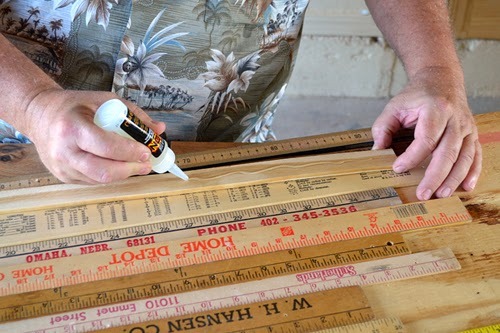 Turn the table top with glue onto your leveled yardsticks on the plywood sacrificial board. Clamp down (or if you don't have clamps simply use whatever weight you can find like heavy paint cans) and allow the glue to fully dry. We gave this step 24 hours to allow for a good, strong cure. Now it's time to turn this strange looking assembly into a gorgeous table or desk! 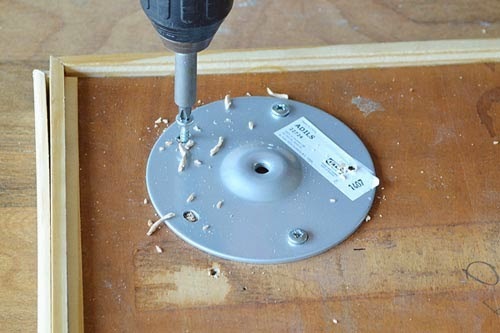 Simply use a circular saw to cut through your top and the rulers. Be sure that your blade doesn't go all the way through your sacrificial board. 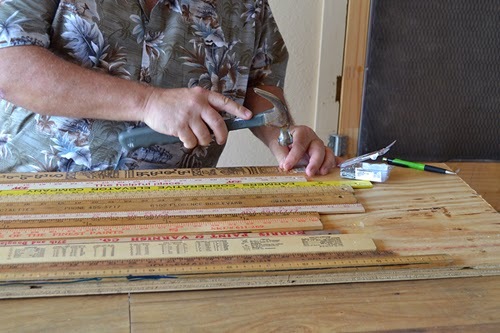 Or you can precut the sides of your tabletop or board and just trim the yardsticks. 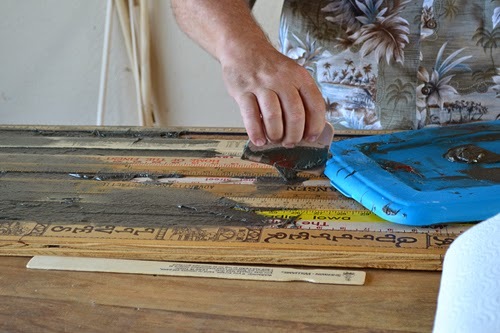 We found this was easier on the plywood blade but more difficult to get a nice, smooth edge. 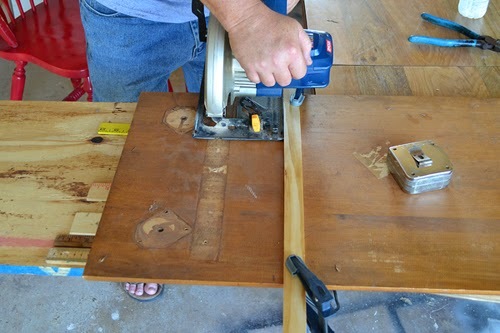 Once all of the sides are trimmed, the tabletop will easily come off. 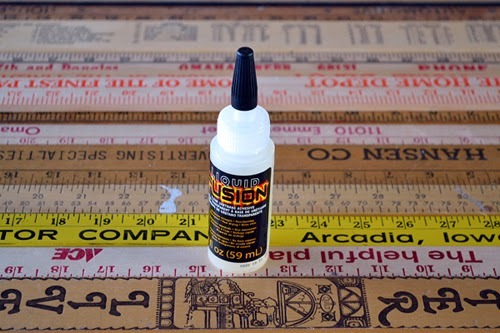 If you have any edge pieces that chip on especially old yardstick, use your Liquid Fusion to get them back on there. Place a piece of a plastic shopping bag on top of the area and clamp down to apply constant pressure and allow the pieces to dry smoothly in place. 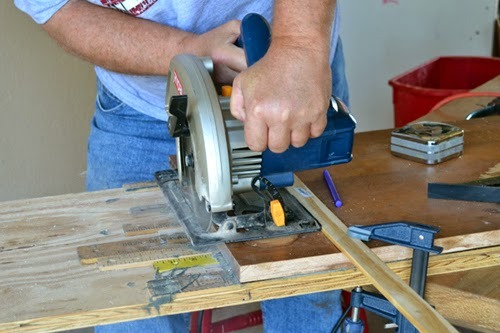 To start finishing up the table, take pieces of wood lath and secure around the edges of the table. First use your Liquid Fusion and follow with trim nails. Be sure to apply liberally to any corners to ensure a tight fit. 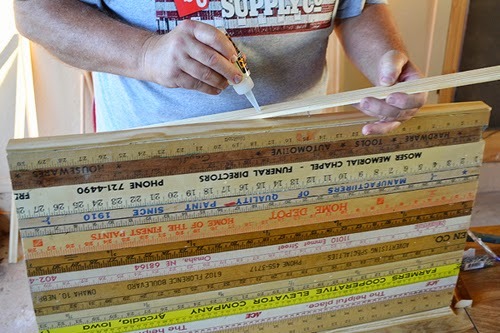 Take larger outside corner molding (this is 15/16) and trim to fit around the outer edge and frame in the yardsticks. We did this to help hide any rough cut edges as well as to have a thin lip to help catch pencils and whatnot from rolling off of the table. You'll need to trim the wood at angle cuts. Practice for a bit on cheaper wood to ensure you get nice, straight corners! Since the original table was a coffee table, we purchased four table legs for around $4 apiece at Ikea to finish this table top into a proper desk. You can seal your desk with polyurethane to ensure that it will last a good long time, especially if it is going to be used by a little boy! 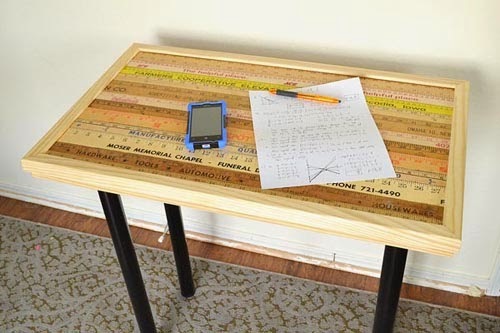 Since we started with an older coffee table AND we needed to make it for a smaller space, this desk is great for homework but not great for huge projects. It only takes up a small amount of space and a desk chair fits comfortably underneath so it's all good! What do you think? 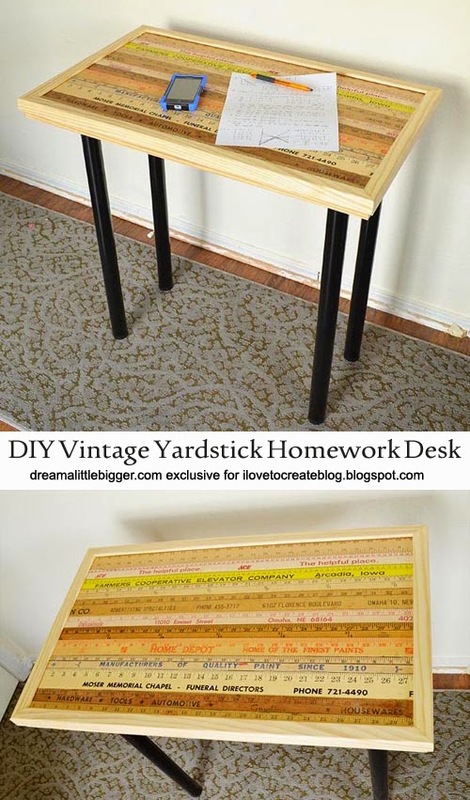 Are you going to be making your own yardstick table or desk? If you loved this DIY please check out my blog Dream a Little Bigger! What a great idea. Even some junk can still be in used if we have guidelines like your post and sometime we should be creative to create our own. Thanks for sharing. I should try something using my hardware tools. Very cool idea! Would love a larger version of this table for my crafting... if only I had the space.